Things are moving swiftly in New Zealand on the FPB 64s. Hull number one is being ground now, and the plumbing and systems are just about ready for furniture installation to begin. 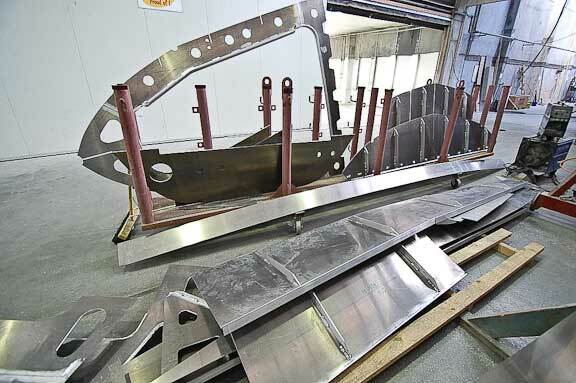 The metal for hull #3 is well along and parts for hull #4 will start seeing the cutting table in the near future. When you see plumbing covered in insulation it is a sign that this phase of construction is nearly complete. 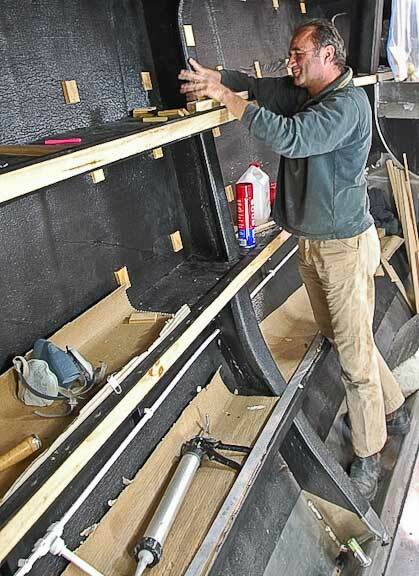 These timber and plywood strips are epoxied to the aluminum and will serve as attachment points for hull liners and shelving. 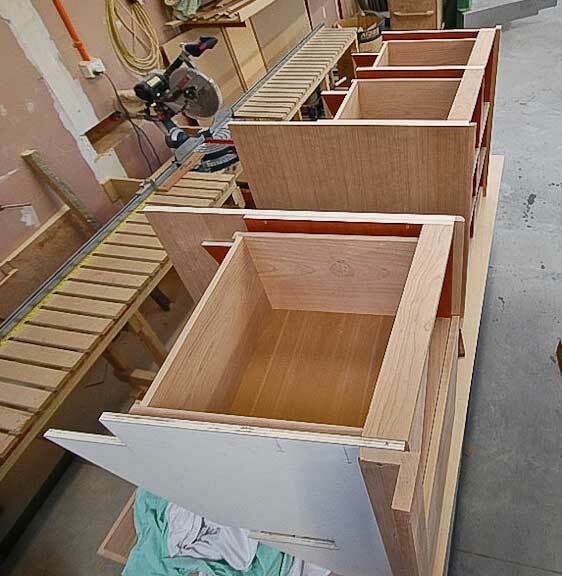 Speaking of furniture, this is the office desk module coming together. 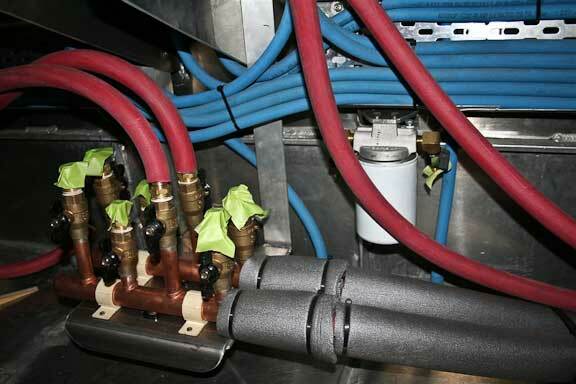 The hot water circuit from the Kabola boiler feeds these manifolds. 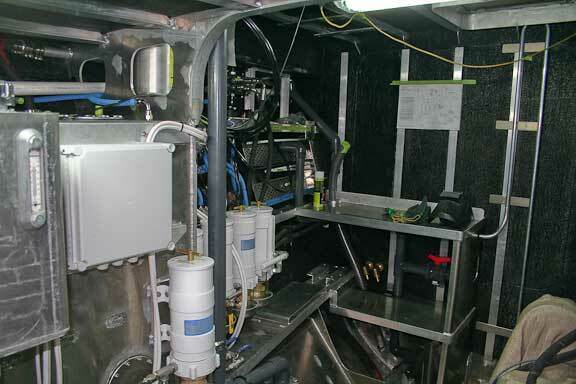 The manifolds are then connected to the various heater coils. Valves are adjusted to even flow and adjust for temperature/pressure variances from plumbing run lengths. 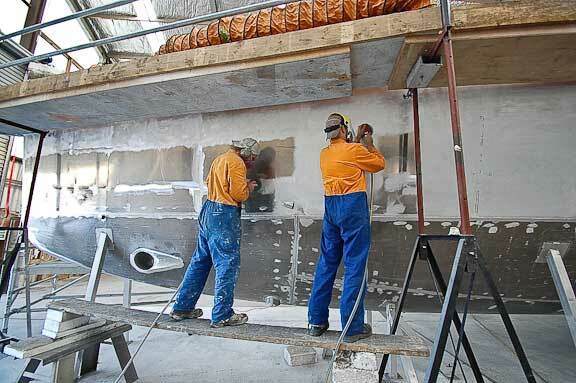 Modern yachts have lots of plumbing which requires space for construction and later access. 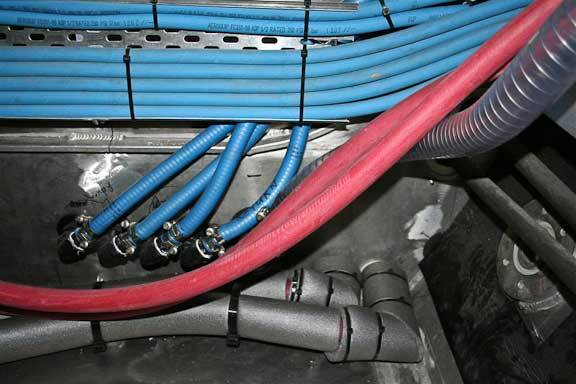 We are looking here at fuel lines, air conditioning cooling, and heating hoses! 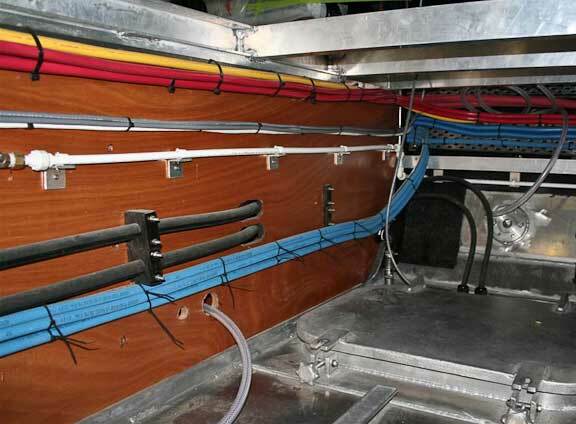 We keep showing you this same bulkhead, now with its wiring and plumbing runs almost finished. 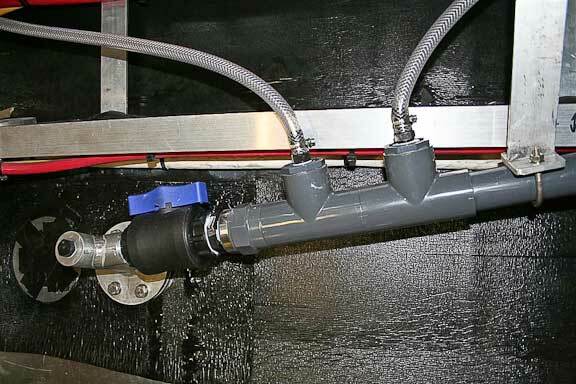 Note the double rolled edge hose clamps on the air conditioning cooling pumps. Condensate is always a problem with air conditioners. 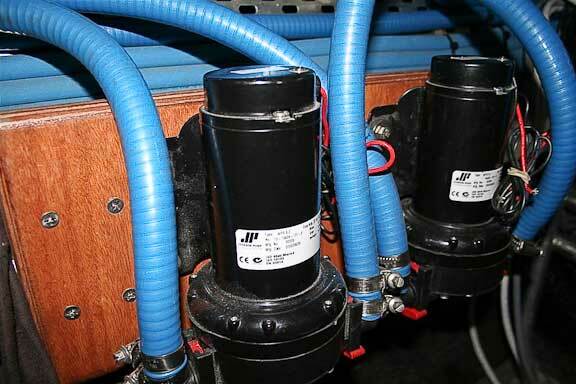 We are using a two inch (50mm) surge tube which exhausts above the waterline to get ride of condensate. The hole through the topside is small, and covered with a clam shell, to minimize the risk of a wave impact back flooding the condensate tray on the air conditioning pallets. 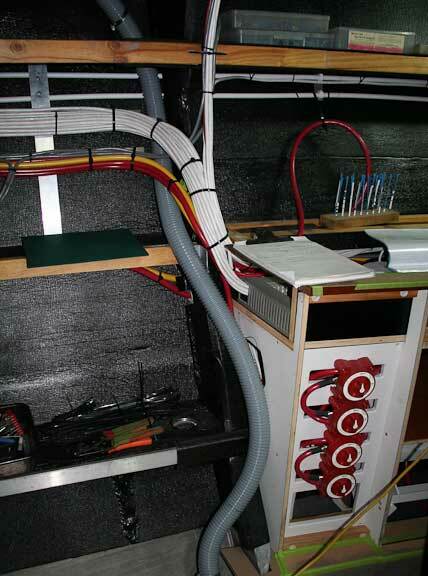 The battery switches for the engine/genset are now wired up (forward end of aft starboard cabin). These allow a center tap on the house bank to be used to start the engine/genset if there is a problem with the dedicated starting batteries. Looking towards the work bench in the port forward corner of the engine room. A set of drawers for tools will sit on the lower shelf. 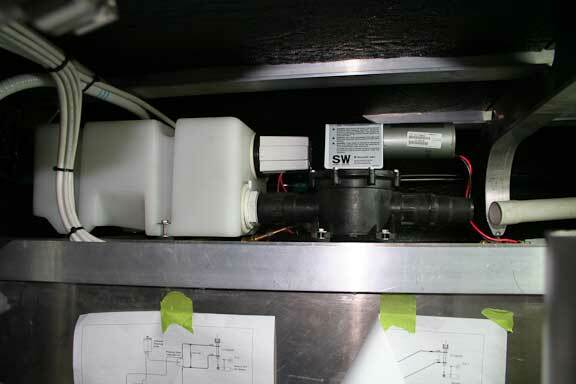 A SeaLand vacuum generator for the VacuFlush toilet in the guest head. 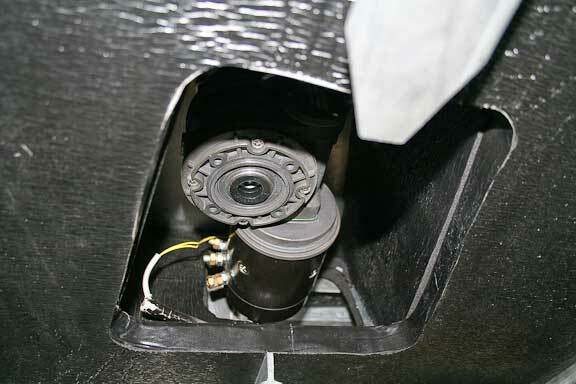 Looking up at the electric deck winch gear box and motor towards the aft end of the engine room. 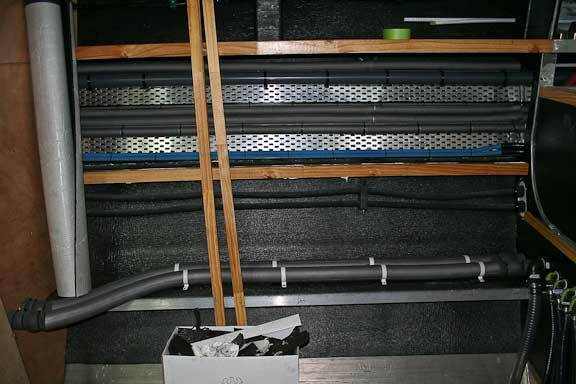 Having an open access allows good air flow for cooling and inspection. This entry was posted on Friday, July 24th, 2009 at 6:46 am and is filed under FPB 64 Updates. Both comments and pings are currently closed. Above pictures and information are really important, gives a lot of knowledge.